Posted by Mollie Hamelund on January 30, 2019 in Basketball, Sports. The Ferris men’s basketball team established themselves as No. 1 in the North Division of the Great Lakes Intercollegiate Athletic Conference (GLIAC) with their win over the Lake Superior State University (LSSU) Lakers Saturday, Jan. 26. The Bulldogs won 97-76 in their fourth victory in a row against the Lakers, moving to 15-7 on the season. During last year’s National Championship winning season, the Bulldogs had only one loss the entire year, which was to the Lakers. The Bulldogs and Lakers were in a three-way tie for first place with Wisconsin-Parkside entering Saturday’s match, consistent with the annual battle between the two teams for first place in the GLIAC. Ferris head Coach Andy Bronkema didn’t look at the game as anything else than just another game to win in conference play. 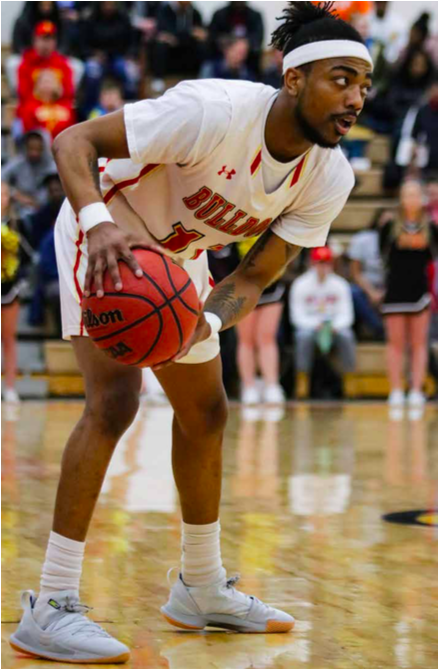 With the Lakers being the only team able to hand the Bulldogs a loss last year, they were seen as the rivals and team to beat by many, but Bronkema said past seasons don’t affect the team’s mindset. “Each year’s different,” Bronkema said. The Bulldogs came into the game with offensive ferocity and led the Lakers the entire game, defeating them by more than 20 points and out-rebounded them by 15. Thrower was the game’s top scorer with 22 points and 7 assists. Thrower also managed to get five defensive rebounds and one offensive rebound. Ferris senior wing Markese Mayeld had the second most points with a total of 17 while also adding 10 rebounds to the Bulldogs’ 50 total. The reserves also showed up this game with sophomore wing Armani Tinsley bringing 14 points for the Dawgs. The Bulldogs look to finish strong with just less than half of the season remaining, and Thrower claims it’s a day-to-day effort. “We just try to take it day by day, game by game and try to finish as strong as we can,” Thrower said. The Bulldogs return to action at Saginaw Valley State University 8 p.m. Thursday, Jan. 31.